The West 11U Softball All-Stars with their district title banner. WEST PORTSMOUTH — Throughout its history, the West Side — both at the youth and high school levels — have had a tradition of fielding strong softball programs. If one needs proof of that fact, 10 OHSAA State Final Four appearances — including four in a row from 1986 to 1989 and six in a row from 1998 to 2003 — will certainly prove that West, along with Wheelersburg and Clay, are the leading traditional softball powers in Scioto County. And as a whole, it looks like the Lady Senators will be returning to that glory sooner rather than later — thanks to a talented crop of youngsters in the nine to 14-year old range. The West 11U Softball All-Stars, who are one of three teams on the West Side to have qualified for state participation as part of the West Portsmouth American Little League system, proved that former point in spades as West, after falling behind by a 1-0 count after an inning of action, rebounded by scoring a run in the fourth to tie the score, five runs in the fifth inning to take a commanding lead, and two runs in the sixth en route to putting a District 11 Championship Game bout against Fairland away en route to a 9-1 victory over a talented softball club at Boone Coleman Field in West Portsmouth. As the late scoring suggests, however, the contest didn’t come with ease, according to West 11U head coach Shad Ford. That was certainly evident on both sides for the Lady Dragons, as Fairland’s effective baserunning and plate discipline allowed a run to come across on an error and allowed the Lady Dragons to take a 1-0 advantage after an inning of action. West, meanwhile, struggled to get going at first as the Lady Senators went down in order over the first three frames while striking out four times behind Fairland’s play on the defensive end of the diamond. Kyndall Ford, however, proved to be huge for the West Side during the contest with her play inside the circle. Over the first three innings of action alone, Ford recovered from four walks by stranding four baserunners, which prevented Fairland from obtaining a more comfortable advantage. She ultimately gave up just one hit and no earned runs in the contest to allow West to remain in a good position throughout Thursday evening’s affair. The contest, however, began to change in a major way when West’s offense, as it circled back around to the top of the order, gained steam in the fourth frame of action. After Kate Rollins led off the inning with a walk, Emily Moore followed with a single and Ford drew a walk herself to load the bases with nobody out, which allowed Myla Mead to bring in Rollins with two gone in the top of the fourth frame as the Lady Senators tied the score at one apiece. That inning, however, was just a precursor of what was to come. In the fifth frame, back-to-back singles by Morgan Stiles and Brooklyn Pitts were followed by an error that scored pinch-runner Shelby Rhea, which gave West the lead, and Moore and Ford made Fairland pay dearly with a two-RBI single and a two-RBI double, respectively, to turn the tightly-contested affair into a runaway. A one-out sacrifice bunt by Emma Sayre, which scored Ford, rounded out a six-run fifth frame as the West Siders turned a 1-1 deadlock into a commanding 7-1 lead. Two additional runs, which came across in the top half of the sixth inning on an error, allowed the well-versed group to cruise to the district title. 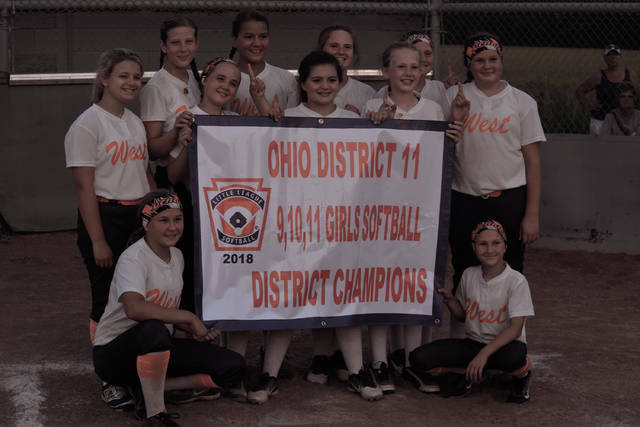 With the contest at its conclusion, both units will advance to the Ohio 11U State Softball Tournament in Tallmadge, which will run from July 28 to August 4. They’ll be the representatives for the District 11 realm. However, Ford can’t help but see what could be down the road for this group — which is a possible return to the glory days of yesteryear if the same dedication remains.